Sororities will not hold formal fall recruitment for upperclassmen this year. The Panhellenic Association is shifting to only holding recruitment during spring semesters. Sororities will not hold formal recruitment during the upcoming fall semester as they transition to a deferred recruitment policy, leaders of the Panhellenic Association said last week. The council made the decision after a vote among chapter leaders and a recommendation from the National Panhellenic Conference to limit primary recruitment to one semester each academic year, Panhellenic Association President Dani Harton and Vice President of Recruitment Elizabeth Jessup said. Council leaders said the switch would help the Panhellenic Association focus their resources and energy on one recruitment period. The initial timetable for deferred recruitment, announced last April, allowed formal recruitment to take place for non-freshmen for a final time this fall. But Harton and Jessup said that since it was already decided that future formal recruitments would only be held in the spring, the chapters didn’t see a reason to deviate from the long-term plan for one semester. Greek life administrators are implementing the new policy next academic year, mandating that freshmen complete 12 on-campus credits before joining a Panhellenic Associate or Interfraternity Council chapter. Student affairs officials said last spring that the new policy would help freshmen acclimate to college life before joining a fraternity or sorority. 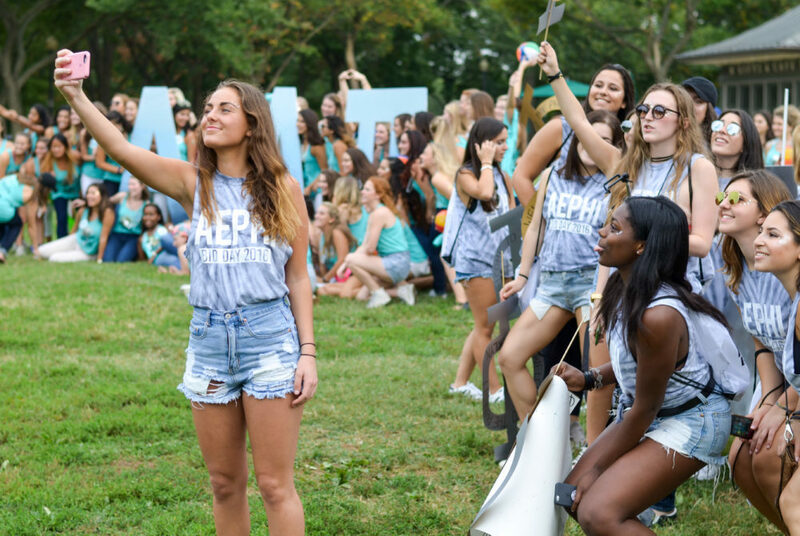 This upcoming fall, Panhellenic Council chapters that have a membership below the median chapter size on campus – 153 members this semester – will be allowed to hold informal recruitment for non-freshmen, Harton and Jessup said. They said the process will be similar to how spring recruitment was conducted in past years. Harton said the Panhellenic Association’s decision was based on guidance from the national conference not to hold two rounds of formal recruitment, one for freshmen and another for non-freshmen, within the same year. Deferred recruitment will mean that chapters will have new members who are more prepared to enter their organizations and more informed about the commitment they are making. An information manual from the National Panhellenic Conference also opposes deferred recruitment, arguing that “a fall primary recruitment has more advantages than any other recruitment time period” because it connects women with chapters quickly, helps with their adjustment to college, creates a more objective selection process and allows sororities to add members at the same time that other student organizations do on campuses. Jessup said she contacted councils at the GW’s peer institutions that have already instituted deferred recruitment policies and will meet with recruitment officials in each GW chapter to help them transition to the new policy. We want to make sure that individuals are as prepared as possible when deciding whether or not to join a greek organization. The council also plans to revamp its education program for new members next academic year. It will be held in the fall prior to formal recruitment, instead of at the conclusion of the process, and will focus on helping potential new members decide if they want to join a sorority – rather than educating them once they’ve already received a bid, Harton said. “We want to make sure that individuals are as prepared as possible when deciding whether or not to join a greek organization,” she said. Dani Weatherford, the executive director of the National Panhellenic Conference, said the conference would base its advice to GW on past experiences with universities that switched to spring recruitment. At least six of GW’s 14 peers schools have already implemented deferred recruitment for fraternities and sororities. “We have peers and partners who’ve made this transition before, which means we can share resources and best practices with campus leaders and help ensure that the sorority community at GW doesn’t miss a beat as we move into next year,” Weatherford said.